Custom designed, built and specified, Peter Milner 80'. 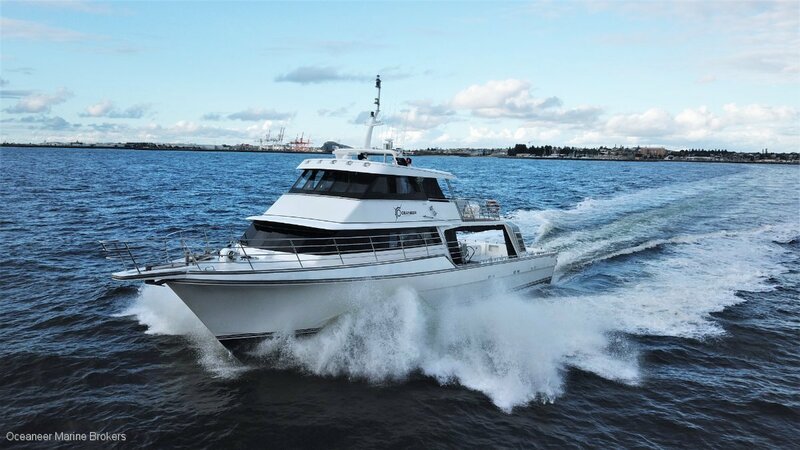 This long range, large volume blue water cruiser is complemented with a premium luxury fit out enabling ultimate comfort for the extended voyages. 3 x double beds and 7 x single berths in 4 separate cabins with 3 toilets and 2 showers provides great privacy and spacious live aboard accommodation. Powered by twin V16 Deutz Diesels wound back for economy and durability. 2 x Onan heavy duty gensets powering all 240V. Long range fuel tanks with 12,200L capacity. Replacement value for this vessel today exceeds $6 Million dollars. Please contact Oceaneer Marine Brokers for full inventory and details. Inspection will impress. All offers will be presented.